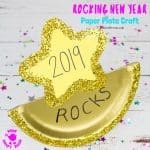 We love this Santa Finger Puppet craft and the free printable Santa finger puppet template mean it’s super easy to make. 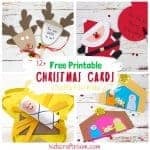 This are such a fun interactive Christmas craft for kids and a great way to encourage imaginative play and story telling. 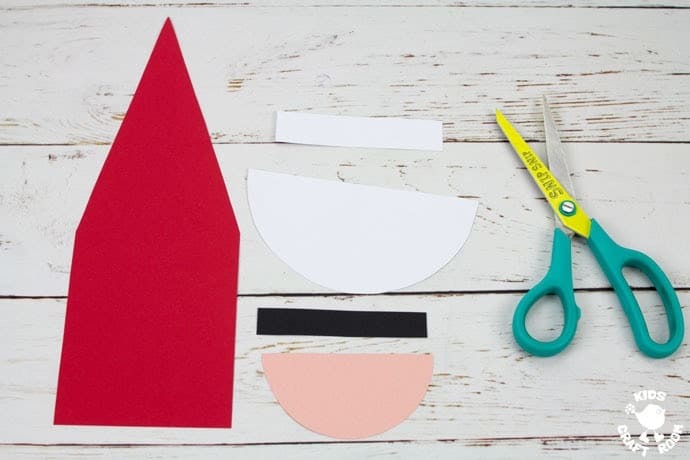 There are two ways to make this easy Santa craft. 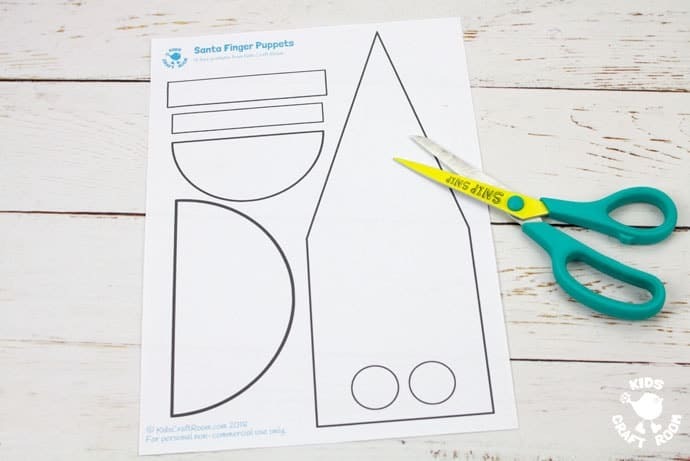 You can print the Santa finger puppet template and colour it in with markers, pencil crayons or paint. 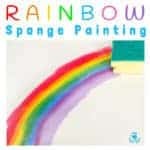 Alternatively you can trace around it onto coloured card like we did. 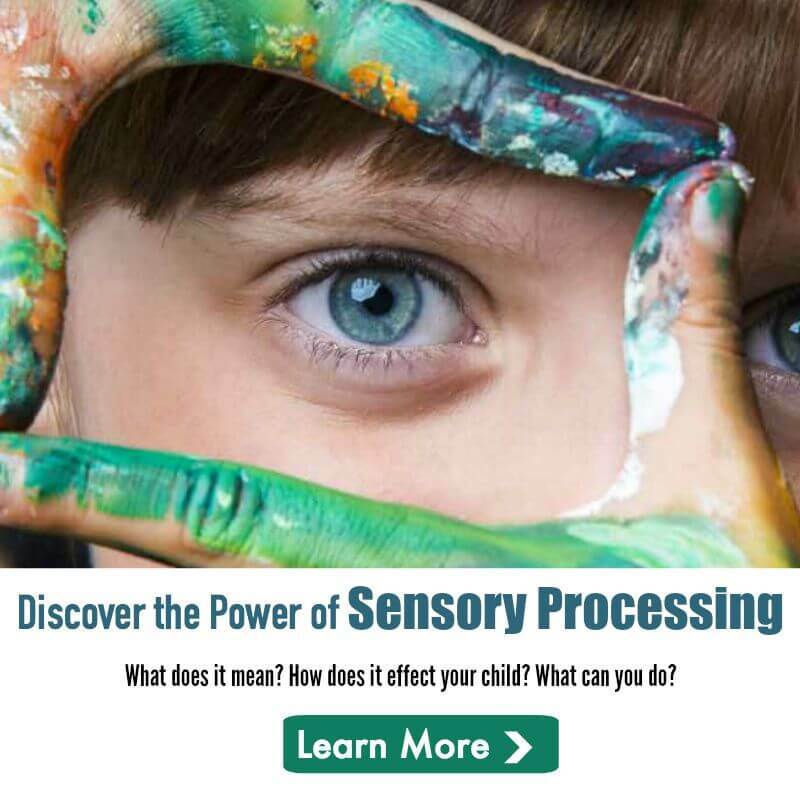 Both methods make gorgeous Santa Finger Puppets that are fun to play with. 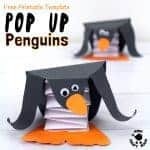 These Santa puppets have concertina folded hats and scissor cut beards which gives them a lovely 3D element and lots of opportunities for kids to develop their fine motor skills. Pop your fingers through the holes and walk your fingers to make Santa Claus stroll around, hop, skip and jump! Ho, ho, ho! 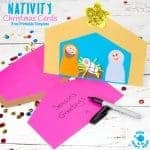 If you love interactive Christmas crafts like these Santa Finger Puppets then take a peek at some of our other favourite Christmas crafts that kids can play with too. 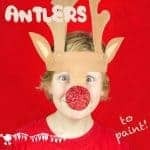 We adore our Jumping Elf Puppets, Reindeer Antler Hats, Trim Santa’s Beard and Pop Up Penguins. All of them are so fun! 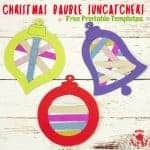 We are showing you how to trace around the Santa craft template onto coloured cardstock but you could colour the template direct if you prefer. 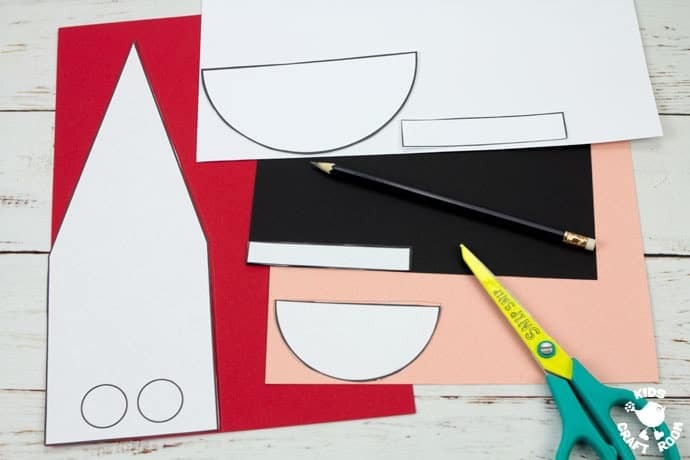 2 – Cut the template pieces out and trace around them onto coloured card. Red for Santa’s body, white for the large semi circle and large rectangle. Black for the small rectangle and finally skin colour of your choice for the small semi circle. 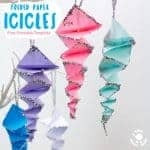 3 – Cut out all your coloured pieces. 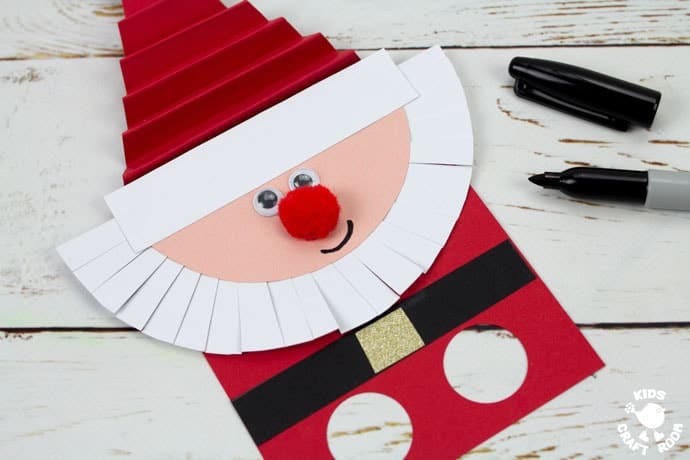 4 – Concertina fold Santa’s red hat and use your hole punch to make two finger holes at the bottom of his body. 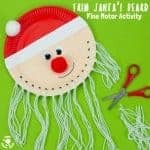 5 – Snip all around the white semi circle to make Santa’s beard. 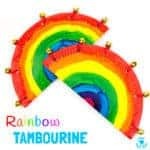 (This gives kids lots of wonderful scissor skill practise.) Glue it below his concertina hat. 6 – Glue on Santa’s white hat trim and black belt. 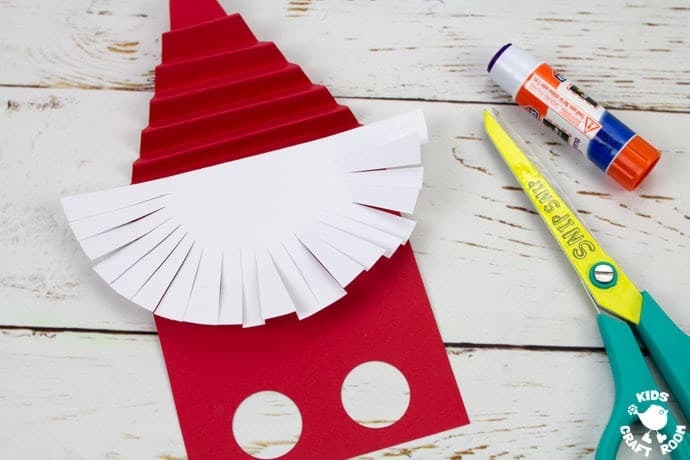 7 – Add a red pom pom for Santa’s nose and a white pom pom to the top of his hat. If you want to you can use gold glitter tape to make a simple belt buckle. 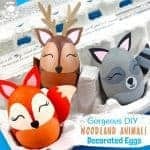 8 – Finish off your Santa finger puppets by glueing on some wiggle eyes and drawing a happy smile. 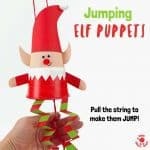 Now your Santa puppets are ready to play with. 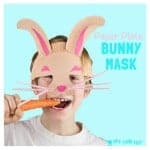 Pop your fingers through the holes to get him moving. I’m sure he’ll go on all sorts of exciting Christmas adventures! 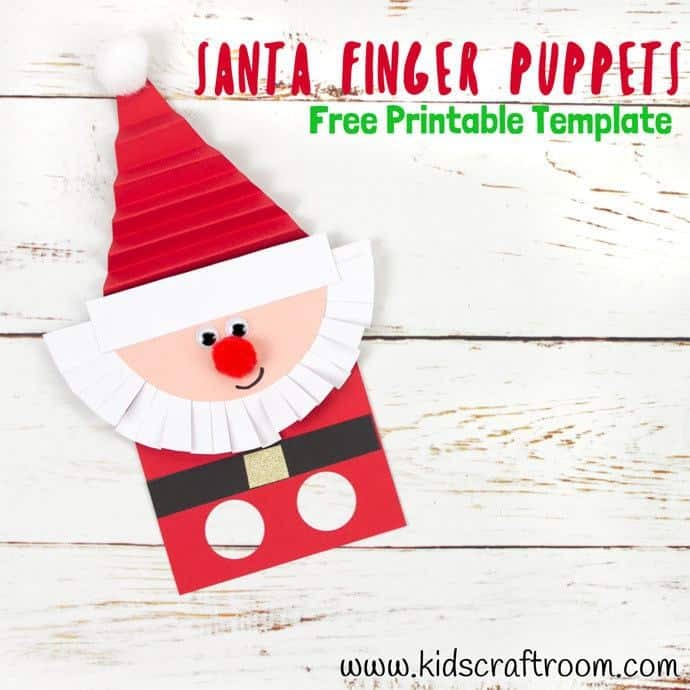 Click here to get your FREE PRINTABLE SANTA FINGER PUPPET TEMPLATE. 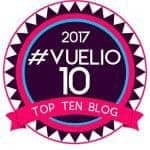 Add your email and the download link will be sent straight to you. 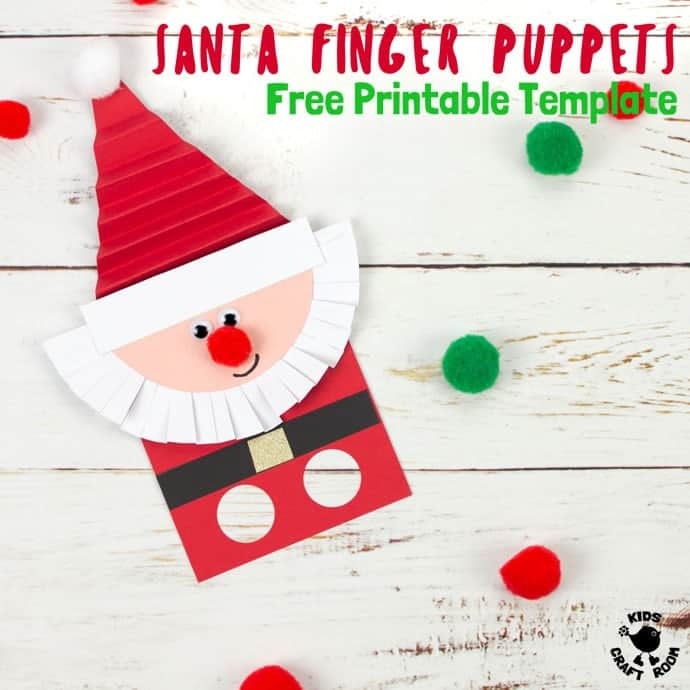 Print the free Santa Finger Puppet Template. 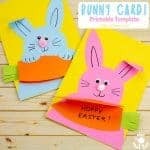 Cut the template pieces out and trace around them onto coloured card. Red for Santa’s body, white for the large semi circle and large rectangle. Black for the small rectangle and finally skin colour of your choice for the small semi circle. 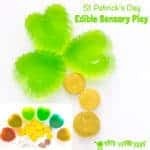 Cut out all your coloured pieces. 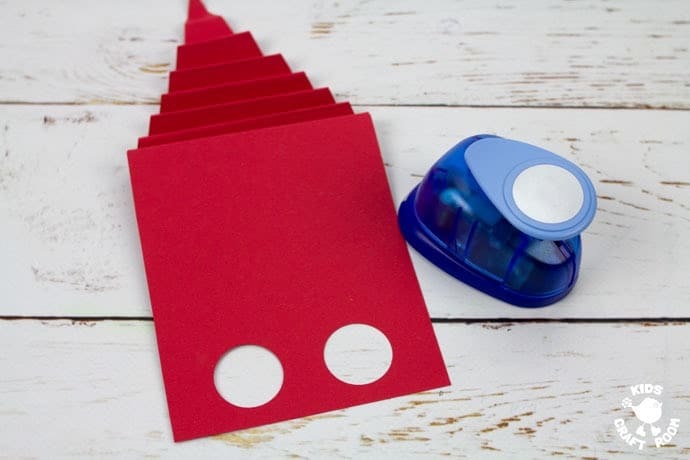 Concertina fold Santa’s red hat and use your hole punch to make two finger holes at the bottom of his body. 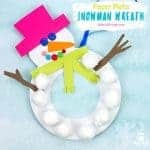 Snip all around the white semi circle to make Santa’s beard. Glue it below his concertina hat. Glue on Santa’s white hat trim and black belt. 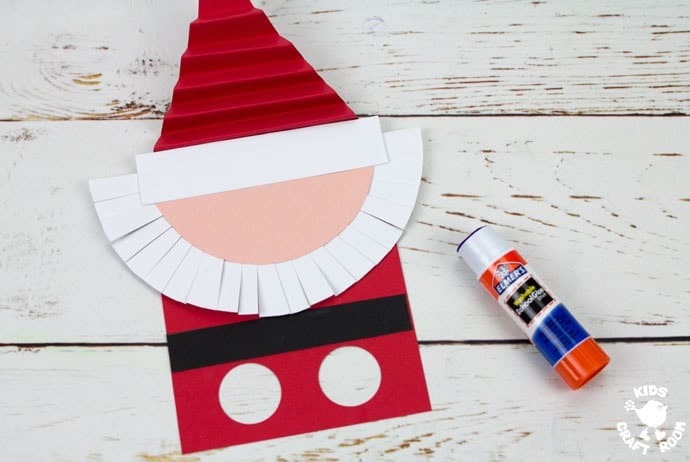 Add a red pom pom for Santa’s nose and a white pom pom to the top of his hat. If you want to you can use gold glitter tape to make a simple belt buckle. 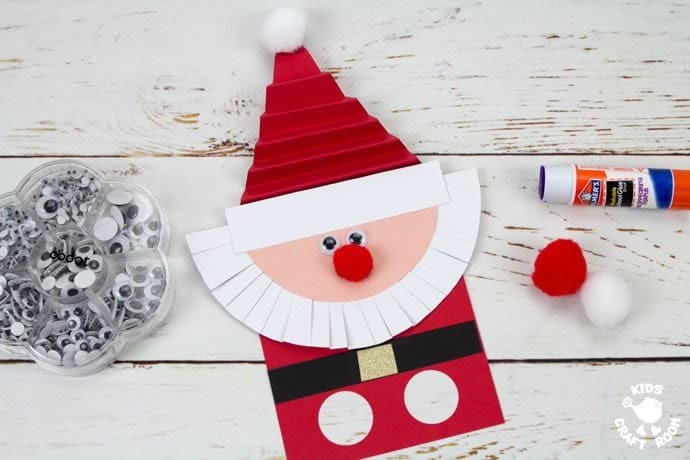 Finish off your Santa finger puppets by glueing on some wiggle eyes and drawing a happy smile. 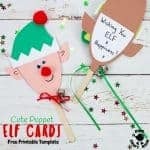 If you are looking for some whole hand Santa puppets you might like these from Easy Peasy and Fun.